Full Papers reporting original and unpublished results of theoretical, empirical, conceptual, or experimental research that contribute to scientific knowledge in the areas listed below (the PC chair can advise on appropriateness). Full paper submissions are limited to 10 pages + 2 extra pages for references. Short Papers The goal of short papers is to promote current work on research and practice. Short papers represent an early communication of research and do not always require complete results as in the case of a full paper. In this way, authors can introduce new ideas to the community, discuss ideas and get early feedback. Please note that short papers are not intended to be position statements. Short papers are included in the proceedings and will be presented with a smaller time slot at the conference. Short papers are limited to 4 pages + 1 extra page for references. Tool demonstrations Tool demonstrations should present tools that implement generative techniques, and are available for use. Any of the GPCE topics of interest are appropriate areas for tool demonstrations, although purely commercial tool demonstrations will not be accepted. Submissions must provide a tool description of 4 pages in SIGPLAN proceedings style (see above), excluding 1 extra page for references and a demonstration outline including screenshots of up to 4 pages. Tool demonstrations must have the keywords “Tool Demo” or “Tool Demonstration” in the title. The 4-page tool description will, if the demonstration is accepted, be published in the proceedings. The 4-page demonstration outline will be used by the program committee only for evaluating the submission. Tech talks: Depending on whether there is space in the program, GPCE may solicit Tech talks. See the GPCE’15 tech talks call for contributions for details. For now, if you are interested in presenting a Tech talk, please contact the chairs. Workshops: Workshops will be organized by SPLASH. Please inform us and contact the SPLASH organizers if you would like to organize a workshop of interest to the GPCE audience. 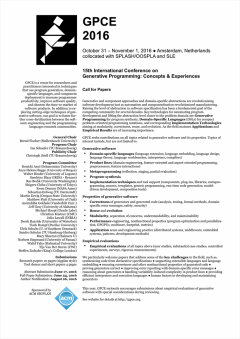 Get the PDF file for the call for papers! Please take a moment to read the instructions below before using the submission site. When submitting your paper, make sure to indicate the category (research full, research short, tool demonstration paper). Note that camera ready versions will be collected by Conference Publishing Consulting. Full paper submissions are limited to 10 pages + 2 extra pages for references. Short papers and tool demonstrations are limited to 4 pages + 1 extra page for references.